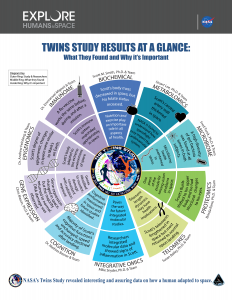 U.S. astronauts Scott and Mark Kelly, who also happened to be identical twins, participated in a twin study that has provided truly unique results. 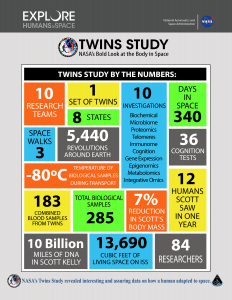 With Scott living aboard the International Space Station for almost one year (340 days), and Mark living in Arizona, the twins were studied by ten teams of researchers, in an effort to understand the impact that a year in space has on the human body. They did this by examining molecular and physiological traits that may be affected by time in space. This is “the most comprehensive view that we’ve ever had of the response of the human body to spaceflight,” said Susan Bailey, PhD, a professor in radiation cancer biology and oncology at Colorado State University, who led one of the research teams. 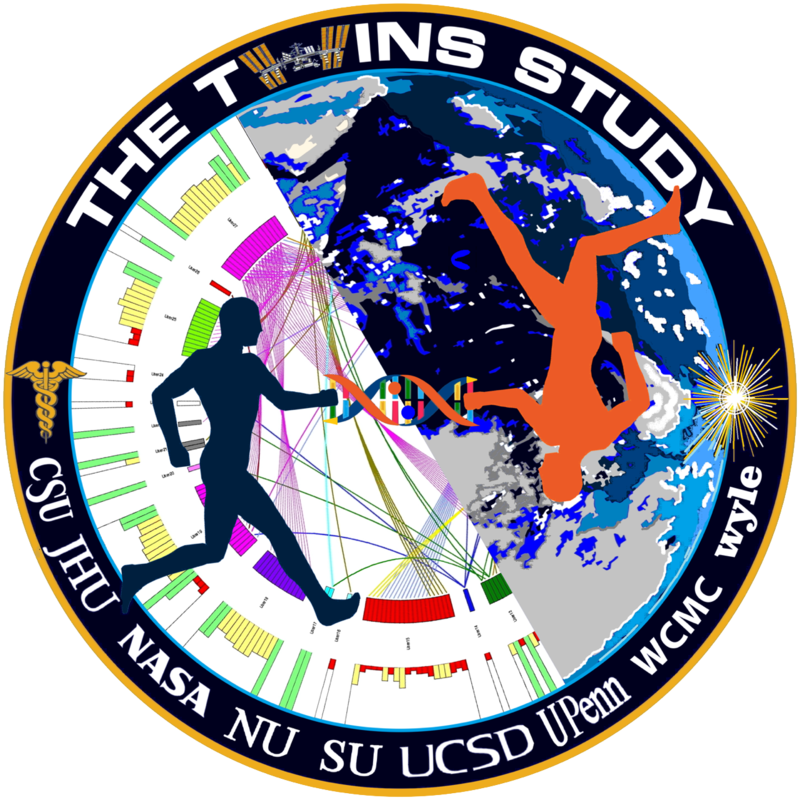 The results were published on April 11th, in Science in a paper titled, “The NASA Twins Study: a multidimensional analysis of a year-long human spaceflight”. The teams of scientists studied the twins’ physiology, memory abilities, gene expression changes and more before, during, and after that year. They focused on any variations that could show how Scott’s time in space affected him physically. Living in the environment in space is different in many ways, including confinement, isolation, and exposure to environmental stressors such as microgravity, radiation, and noise. The team collected physiological, telomeric, transcriptomic, epigenetic, proteomic, metabolomic, immune, microbiomic, cardiovascular, vision-related, and other data over 25 months. After Scott entered space in March 2015, he took blood samples that were sent back to Earth. Sequencing the components of his blood showed that the length of telomeres changed during space flight and again upon his return to Earth. Although the team had predicted that his telomeres would shorten, they had grown 14.5% longer. However, within days after returning to Earth, his telomeres had shrunk back to their preflight length. Several months later, some telomeres were even shorter. Shortened telomeres, in general, have been associated with aging and such health risks as cardiovascular disease or cancer. Gene regulation changes were measured in both epigenetic and transcriptional data. The genes that were most frequently upregulated were those involved in regulating the immune system. Also, changes in gut microbiome composition, body weight, carotid artery dimensions, subfoveal choroidal thickness and peripapillary total retinal thickness, and serum metabolites were noted. Scott’s chromosomes also went through many structural changes, with parts of the DNA being swapped, inverted, or even merged. Most of the changes Scott experienced in space reversed to his preflight state once he returned to Earth. However, there were some lasting changes. For instance, roughly 9% of the genes that had changed activity while he was in space stayed in space mode. Six months after his return, his immune system was still altered, DNA repair genes were still upregulated and some of his chromosomes were still rearranged. Tests of Scott’s short-term memory and logic problems showed that his cognitive abilities had declined from preflight levels. “Changes described in this study highlight pathways and mechanisms that may be vulnerable to spaceflight and may require safeguards for longer space missions; thus, they serve as a guide for targeted countermeasures or monitoring during future missions” noted the authors. In addition, some factors were significantly affected by the stress of returning to Earth, including inflammation cytokines and immune response gene networks, as well as cognitive performance. The authors noted that, “although our understanding of the physiological and functional consequences of 4- to 6-month missions has increased greatly over the 18 years of continuous human presence on the ISS, there is almost no experience with spaceflight length greater than 6 months.” Because missions to Mars—which are planned for the near future (2020s and 2030s)—could last up to three years, more long-term studies are necessary to understand the impact of longer durations in space on the human body.